Minister of Tourism, Hon. Edmund Bartlett, makes his presentation at the Jamaica 55 Diaspora Conference at the Jamaica Conference Centre in downtown Kingston on Wednesday (July 26). Minister of Tourism, Hon. Edmund Bartlett, says the sector is on course for “record -breaking growth” this year. He said that revenue earnings for the first half of the year is estimated at US$1.84 billion, which is an increase of over eight per cent compared to the first six months of 2016. 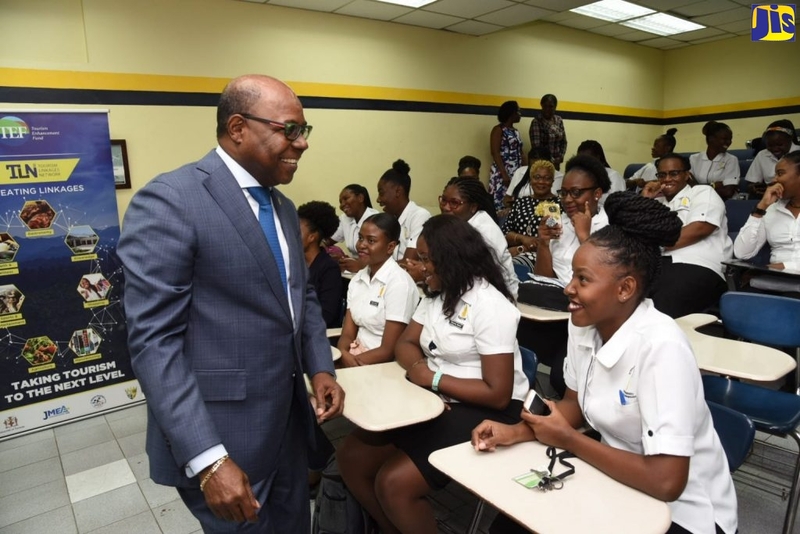 The Minister was addressing Wednesday’s (July 26) session of the Jamaica 55 Diaspora Conference at the Jamaica Conference Centre, downtown Kingston. The country welcomed 2,165,330 visitors up to the end of June this year, which is 3.9 per cent higher than the corresponding period last year. For the first two weeks of July there were 104,098 stop over visitors – a massive 14.9 per cent increase over the same period in 2016. The strong sector performance since the start of the year builds on the successes of 2016, when the sector expanded by an unprecedented four per cent, and welcomed over 3.84 million visitors in total. Gross Foreign Exchange Earnings for the period amounted to US$2.55 billion up 6.2 per cent, with stopover arrival earnings of US$2.4 billion, representing a 6.1 per cent increase; and cruise passenger earnings of US$148.6 million, up eight per cent. Minister Bartlett noted that tourism remains one of the few labour-intensive sectors and directly employs over 106,000 Jamaicans, and another 250, 000 indirectly, through linkages with agriculture, the creative and cultural industries, entertainment, manufacturing, transportation, finance and other services. Over the last 10 years, tourism has expanded by 36 per cent. Direct contribution of tourism to GDP is estimated at 8.4 per cent while total contribution is estimated at 27.2 per cent of GDP.